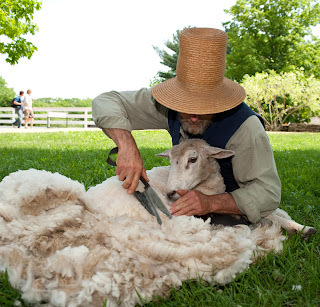 (STURBRIDGE, MA) – May 8, 2012: The sheep at Old Sturbridge Village will get their annual “haircuts” during Memorial Day Weekend May 26-28 as the Village celebrates “Wool Days.” Sheepherding exhibitions with Border Collies are scheduled all day long on Saturday May 26, and OSV farmers will demonstrate sheep shearing 1830s-style throughout the weekend. Active members of the U.S. military and their immediate family members (spouse, parents, and children under 18) will receive free OSV admission beginning Saturday, May 26. (The free military admissions are funded by donations to the museum's annual Field of Flags campaign). For more information and event details: 800-SEE-1830; www.osv.org. Once the sheep are sheared, Village historians in costume will demonstrate the entire wool textile process, from scouring and carding the wool to spinning, knitting and weaving. Visitors can try hand carding (brushing and de-tangling) the wool, and then learn how the Village’s historic water-powered carding mill does the same job much faster. Those who enjoy knitting and crocheting can join Village staff in helping to knit scarves for American soldiers with hand-dyed OSV wool yarn. Visitors can add their own knitted rows to this ongoing project in partnership with the Scarves for Afghanistan Project. Knitting needles, crochet hooks, patterns, and the yarn will be provided. Visitors can meet an alpaca and a llama from Orchid Patch Farm in Southbridge, Mass. and see how their wool differs from sheep wool. OSV historians will conduct spinning demonstrations throughout the weekend using the alpaca and llama wool to spin into yarn with an early 19th-century spinning wheel. 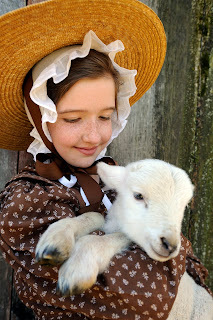 Other highlights include meeting new baby animals, lambs, chicks and piglets, the return of the Old Sturbridge Village stagecoach and the river boat ride, and old-fashioned Base-Ball games played 1830s-style. Throughout Memorial Day weekend, visitors can also try using a modern process to dye wool at the Hands-on Craft Center and they can take home their own small skein of Old Sturbridge Village sheep wool (fee applies). For all times and details: 800-SEE-1830; www.osv.org. Veteran Sheepherder David Kennard and his team of Border Collies from Wellscroft Farm in Chesham, New Hampshire, will demonstrate the dogs' innate ability to herd not just sheep, but pigs, ducks, and goats as well.According to Kennard, the Border Collie breed's quiet power and balance, along with its intelligence and ability to control animals by staring at them with a "predatory eye" makes this type of dog uniquely talented in retrieving livestock. At the end of the sheepherding demonstration, Kennard rewards his dogs by playing Frisbee and interacting with the audience. When sheared, the OSV sheep each produce about five pounds of wool. They are a heritage breed descended from sheep brought by Spaniards to the U.S. Gulf coast in the 1500s and closely resemble the 19th-century sheep breed commonly found on New England farms in the 1830s. Their fleece is soft, and the lanolin in the wool is great for the hands. In fact, shearing is one of the few tasks in the farmer's year which will actually improve the condition of his hands. Sometimes sheep farmers in the early 1800s had to deal with the care of lambs rejected by their mothers. The alternative was to feed milk to the lamb by hand unless a foster mother could be found. A lamb raised by hand is called a "cosset lamb," and probably Mary's little lamb from the famous poem “whose fleece was white a snow…” was tame because it was being raised by hand. Old Sturbridge Village celebrates New England life in the 1830s and is one of the largest living history museums in the country. The museum is open daily 9:30 a.m. – 5:00 p.m. seven days a week. OSV offers free parking and a free return visit within 10 days. Admission: $24; seniors $22; children 3-17, $8; children 2 and under, free. For information:www.osv.org or call 800-733-1830.